These Mini Chicken Pot Pies in a Jar are an easy way to add some fun to dinnertime or your next party. I’ve cooked chicken pot pie so many times since becoming a mom 23 years ago. The family loves it, but it’s fun to change things up and chicken pot pie is no exception. 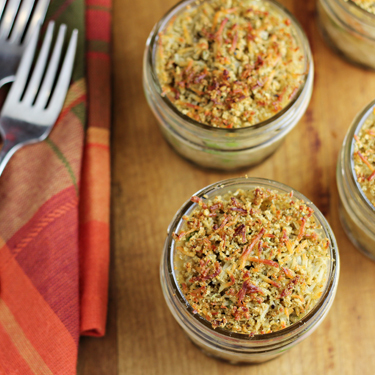 My kids have taken a love to desserts in jars, but why not for dinner? 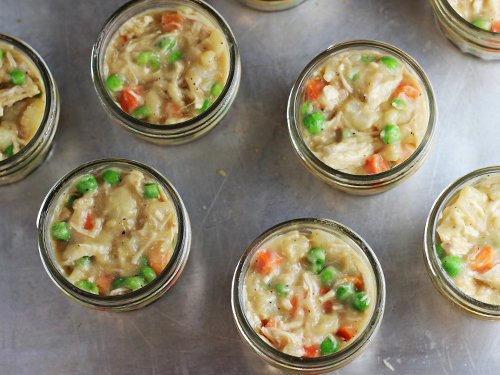 One of the important aspect of these mini chicken pot pies in a jar is that I wanted them to be easy. My usual chicken pot pie is a lot of prep: peeling and slicing carrots, cutting potatoes and onions…and then there’s the crust too. I didn’t want these to be complicated because I love easy meals and I know all of you do too. These are great for parties too. Rather than making a homemade crust or even dealing with a prepared pie crust, I decided to do something different. 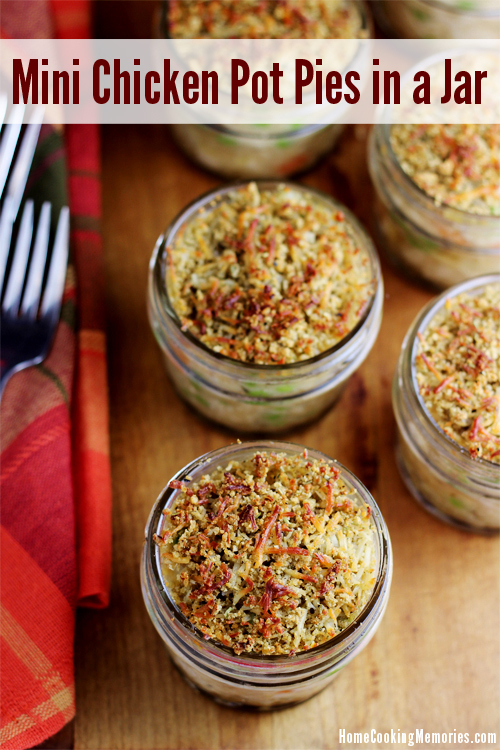 These mini chicken pot pies in a jar use Kraft Fresh Taste, which is a seasoned breadcrumb and cheese mixture, to give it the “crust” on both the top and bottom. Not only did this save a lot of time, but it added a lot of great flavor to my chicken pot pies because I used the Rosemary & Roasted Garlic flavor. You can find the Kraft Fresh Taste in the dairy/cheese section at Walmart (it was hanging on the pegs with the shredded cheeses). Before you go, be sure to print out the $1 off Kraft Fresh Take coupon at http://coupons.walmart.com/ — this makes it an even better deal and gives you the perfect opportunity to try it out. Check out my shopping trip at Walmart to see photos of where I found it and more. 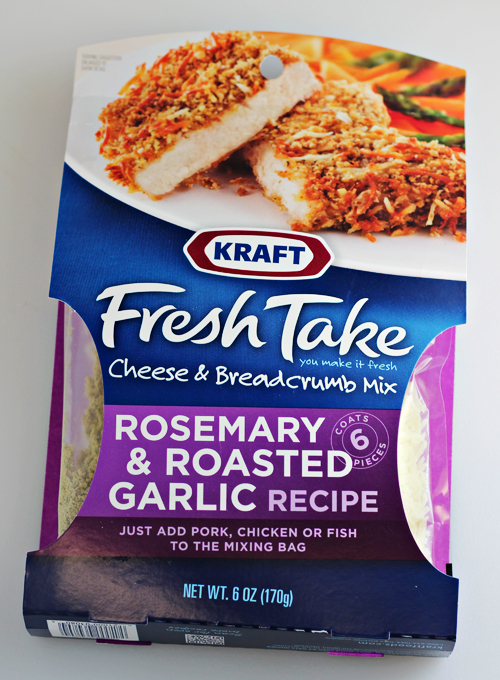 One of my favorite things about the Kraft Fresh Take is that you can bread chicken (or pork or fish) right in the bag. They package it so the cheese and the breadcrumbs stay separate, but when you open it, you pull apart the center seal which makes one larger area for mixing them up together. Then you can coat your chicken and when you are done, throw the bag again. I love quick clean ups! To make the chicken pot pies, you open the bag, as I motioned, and mix up the cheese and bread crumbs. Then, a small amount is placed in the bottom of eight 4 ounce canning jars that have been greased. You make a homemade gravy (sauce) with just a few ingredients and this is mixed into the chicken/vegetable mixture. Then, the cups are filled with the mixture. Finally, the tops are finished off with the remaining Kraft Fresh Take bread crumbs/cheese mixture and then into the oven it goes! 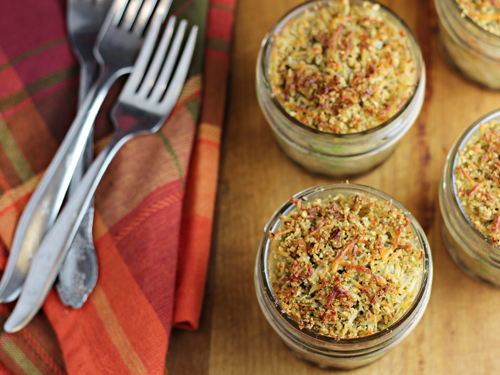 When they are finished, the breadcrumbs and cheese have combined to make a crunchy, flavorful topping. My kids raved about these — and I did hear my son say that if he could, he would marry it, so I think that must be a good sign. Preheat oven to 350 degrees F. Grease canning jars and place on baking sheet. 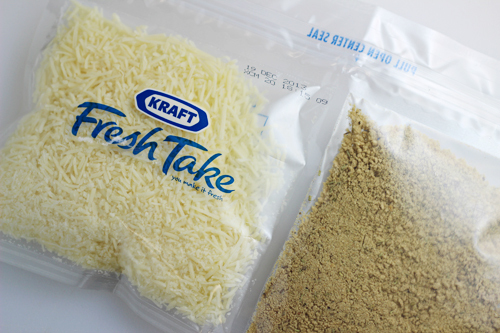 Mix Kraft Fresh Take breadcrumbs and cheese according to package instructions. 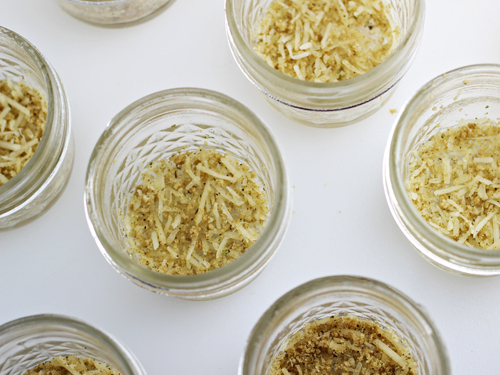 Place approximately 1 tablespoon of breadcrumbs into the bottom of each canning jar. 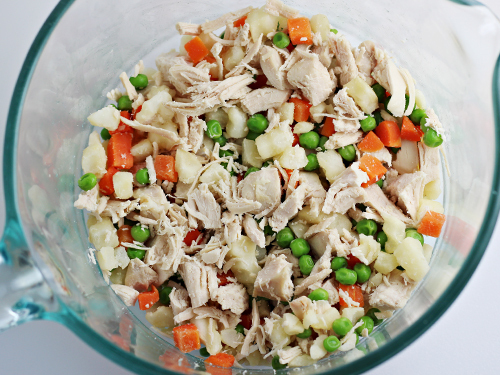 In a medium size bowl, combine peas/carrots, potatoes, and chicken. Heat mixture in the microwave, so items are partially (but not complete) defrosted. In a medium saucepan, met butter over medium heat. Whisk in flour until well blended. Whisk in salt and pepper and continue whisking constantly and cooking the mixture for about 2-3 minutes. Gradually whisk in chicken broth and milk and whisk until smooth and thickened. Taste sauce and if necessary, you can stir in more salt and/or pepper. Gently stir mixture into chicken/vegetable mixture. Divide chicken mixture into jars evenly (I scooped a 1/4 cup first into each jar and then divided the remaining). 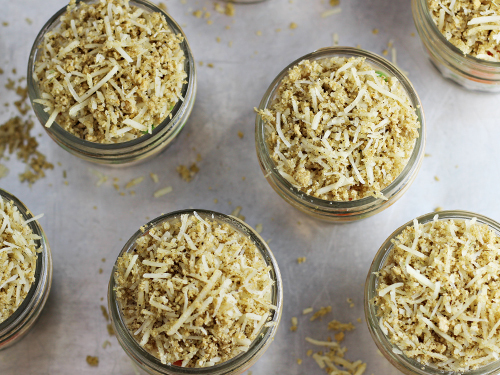 Top chicken mixture in each jar with the remaining Kraft Fresh Take breadcrumbs and cheese. Bake in oven for 15 minutes or until tops are golden brown. –You will want a total of 3 cups of chicken or vegetables for your filling. The recipe shares how much I used of each, but you can substitute as you wish. For example, if you want double the chicken or if you want only chicken and vegetable and no potatoes. The key is to not have more than 3 cups total. –I used 4 oz canning jars. I purchased mine at Walmart, but many stores that sell canning supplies offer this small size. These look amazing and so, so easy. My family isn’t big on chicken but I do love experimenting with it and this looks like something they should all enjoy. Thanks! And they just look so damn cute! Chicken pot pie in a jar? What a great idea. I have tons of canning jars sitting around. This is a perfect cold weather meal. Thanks for sharing on Sunday’s Best linkup. Hope you will share more of your posts. I used to do something similar for the kids I nannied for except ai just made up a crust for the top (I never make one for the bottom crust). These turned out really pretty! love this dish! We made it and it was great. However, my husband raised the question so I want to see what you ladies think. This is our first time putting canning jars in the oven. Is it oven safe? My husband kept scaring me into thinking these will shatter during baking. Is this true? This looks like an awesome recipe. Pinning! This is an awesome idea. Love it. Your son is so funny. My son makes the funniest comments also. I am going to make this one of this days. This would be great to use for making turkey pot pies too after Thanksgiving! Hope you have a great weekend Brandie! What is it about food in a jar?? It tastes AND looks soo much better. Love this idea! These look fantastic! However in your recipe instructions, you don’t say what to do with the salt, pepper, chicken broth & milk. I assume that after you melt the butter and whisk in the flour, you then whisk in the seasonings, broth & milk and stir/cook till thickened. Is this correct? Yes, you are correct — thank you for pointing out this, I’ve updated the recipe to include the information. That looks absolutely delicious! We used Fresh Take the other night and we love it! Your recipe makes me so hungry now! Ok, so now I’m HUNGRY!!! Those look so De-LISH!! Can’t wait to try them! We all love chicken pot pies in this house, and this recipe is so easy, even i could do it! I love it!! Can’t wait to make this for my family!! Looks great! What size jars did you use and how many? Trying to determine how many this will serve. Thanks! I used 4 oz canning jars and they make 8 individual jars. Thanks for asking this!